This colourful steamed cake is a Chinese Nyonya fusion, soft and slightly chewy. I love this since I was a kid. I like to peel the layers one by one and eat it that way. This cake is more like a pudding than a western cake. It is normally called nine layers cake due to the number of layers. It is not essential to have nine layers but that has been a tradition passed down from generation to generation, mother to daughters recipe. Nine is an auspicious word to signify long lasting and long life. There are so many different ways to make this cake, different colours, different flavours and different flour mixture to give various degree of softness and chewiness. Rice flour is the base of this cake mix, tapioca and wheat starch are added to give a more bouncy and chewier texture, some recipes use mung bean starch. I like to add coconut to give nice rich flavour. With the colours, I am not keen to add artificial colours. I sometime use two colours sometime three. 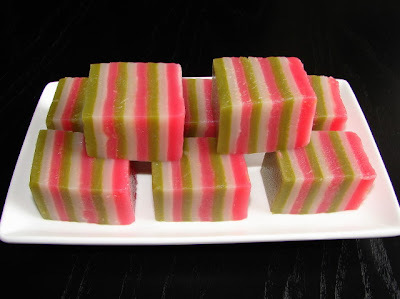 I love the flavour of pandan it goes well with coconut so green has always been the obvious choice, using juice extracted from pandan leaves not artificial flavoured paste. Red is a nice colour too the one ingredient I like to use and to give colour is grenadine syrup, rose syrup is ok too. Strawberry or other acidic juice does not really go well with coconut, better use something with a nice fragrance but low acid. This cake is quite easy to make if you can manage to find a big enough steamer (or pan) and a bit of time standing by the stove. My steamer is not big enough to fit the glass dish I like to use, so I used a large pan with a high doom lid, filling the pan with about 2 - 3cm high with water and sit the glass dish on top for steaming. Can use any dish or cake tin you like as long as it does not have a loose bottom or the mixture will leak. If you don't have a large steamer can make small individual portions using small pudding cups or even heat resistant disposal plastic cups. It's fun to see the layers building up. Here is how I make this cake. * to extract pandan juice, take 50 - 60g of fresh pandan leaves, rinse and cut into small pieces, then put in a mini blender with 150ml water. 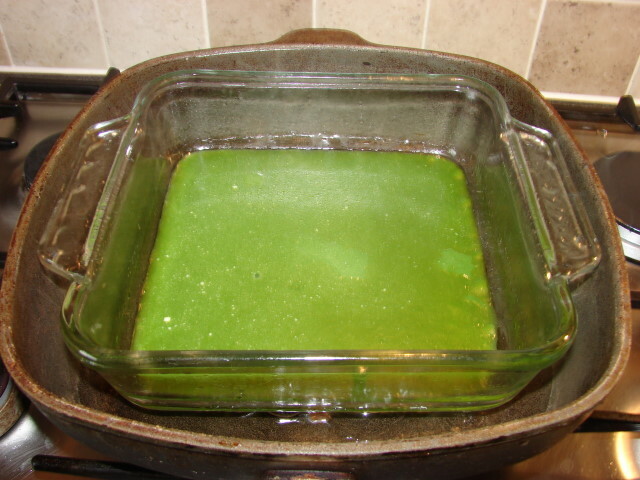 Blend to a pulp, squeeze out juice with hands then strain with fine sieve. Need 150ml juice. Warm coconut milk if solidified. Mix with all flours. Put this mixture on a scale then slowly add enough water to make up to 1200g in total. Mix till no lumps. Stir the mixture just before dividing into 3 equal portions, each weighing 400g into 3 easy to pour containers or mixing cups. To make white part just add sugar and water. Stir to dissolve sugar. This portion will weight about 600g. This is to be divided into 3 portions. See next step. 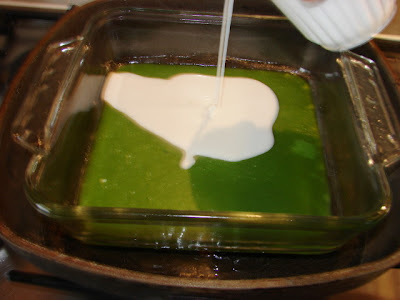 To make green part add sugar and pandan juice. Stir to dissolve sugar. This portion will weigh. This is to be divided into 3 portions. See next step. 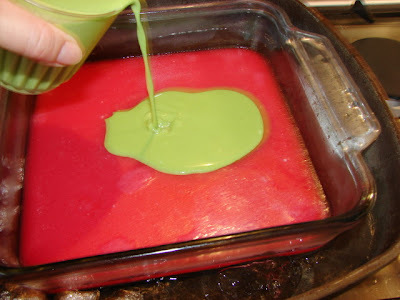 To make red/pink layer, add sugar and syrup. Stir to dissolve sugar. Less sugar because syrup is already sweet. This portion will weigh about 600g. This is to be divided into 3 portions. See next step. Take 3 smaller cups. 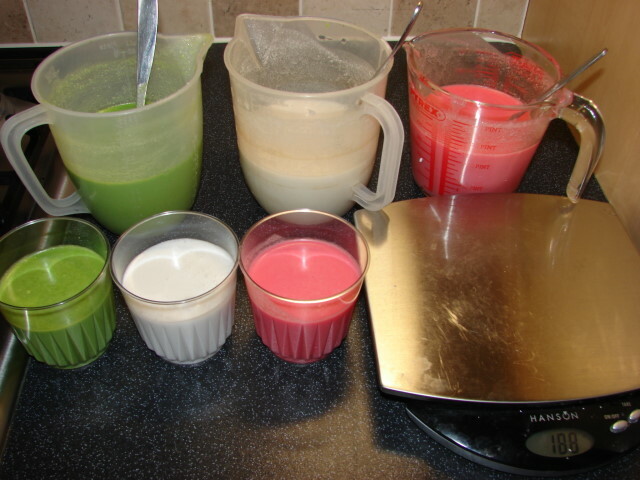 Take each of the colour mixture, weigh and fill cup with about 200g mixture. If the glass dish or cake tin does not have a equal size from bottom to top (straight edge), divide the mixture according to size of dish or tin. 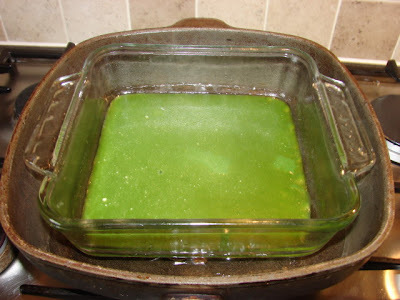 Grease the glass dish or tin lightly with oil. Heat water in steamer, when boiling. Add container. Heat till container is hot. Wipe off any condensation inside container with clean tea towel. Pour in first portion from small cup. Any colour you wish. Steam for about 4 - 5 minutes or till the layer is set, check centre always the latest to set. Then pour in second colour from small cup, steam and pour in the next colour. Once the small cup is empty, fill up again with next portion. Continue building up the layers. After the last layer, continue steaming for another 12 - 15 minutes to ensure the whole cake is cooked through. at each stage of the process, flour will settle to the bottom of the cup/container. 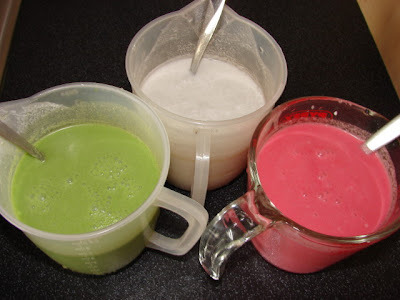 Before dividing the mixture into cups/containers or pouring mixture to steam, make sure to stir the mixture first. sometime a little colour mixing can happen during pouring and steaming. Just make sure the last layer is cooked and set before pouring on next layer. avoid too much water condensation dropping on the layer, if so wipe or absorb with paper towel. if steaming water is drying out, make sure to top up. make sure the glass dish or cake tin is level so the layer is evenly spread. After the cake is cooked. Take it out, loosely cover (or condensation will build up on top of cake) with foil or tea towel without touching the cake and leave to cool completely before cutting or eating. Any left over must put in fridge. Will keep for few days. This is excellent indeed. I must try it out...I used to depend on mum doing all the work ....and then later a sister in law...now she has moved away I have to make lots of kuihs myself...sob sob...thanks.